ArtsWestchester’s “Give Us The Vote,” a contemporary art exhibition in downtown White Plains, examines the state of voting rights in America today. The exhibition is inspired by the 100th anniversary of the suffragist movement in NY State, one of the most powerful grassroots political movements of the 20th century. Women and men from all walks of life rallied together to win women an equal say in the democratic process and full recognition as citizens. The battle for the ballot raged through the Civil Rights Movement leading to the Voting Rights Act of 1965, ensuring that the right to vote would not be denied on account of race or color. Still today, not every citizen has equal access to the polls. Each election cycle reveals remaining disenfranchised populations and raises controversy about who should, can and does vote. In addition to recognizing the achievements of the suffragists, artworks will address the many enduring barriers to the ballot including gerrymandering, stringent voter registration requirements, voter registration roll purges, and revisions to the Voting Rights Act. Please join us in our gallery for Shop and Sip, a pop-up shopping experience that is a part of ArtsWestchester’s Get Over the Hump Wednesday Series. Every third Wednesday through January 17 artists and designers will have their handmade items on display and for sale in our gallery from 6-8:30pm. Visitors will be able to enjoy a glass of wine while indulging in this special opportunity to shop! For more information, contact Kim McKoy. Enrollment is limited. To learn more click on dates above or call 914.428.4220. 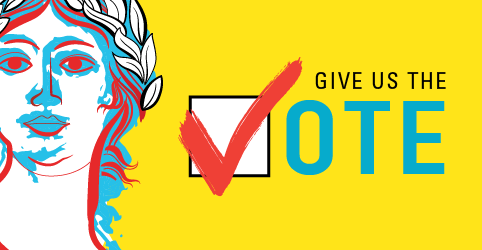 Join artist Pedro Nel Ospina to create your our mini voting booth or ballot box like the artists in Give Us the Vote and share what the right to vote means to you. All day voter registration with Rock the Vote! Click here to reserve your spot, or call 914.428.4220. Teens and adults will express themselves with spoken word poet Toni Blackman during this afternoon of freestyle poetry writing and performance.